This lace trumpet gown with tulle skirt from Essense of Australia is the perfect choice for the classic bride looking for a touch of sparkle and drama on her wedding day. Beginning at the sweetheart neckline, lace is artfully placed throughout the bodice of this gown, trickling down onto the full and glamorous tulle skirt. All-over Diamante beading gives this gown the sweetest sparkle - leaving you twinkling with every step. Choose from a lace-up back of zip up under crystal buttons. Each detail of this Essense of Australia Lavish satin wedding gown is meticulously designed to give you the gown of your dreams. The halter neckline and back feature gorgeous illusion lace detailing in your choice of ivory or white. The back zips up with ease under fabric-covered buttons. 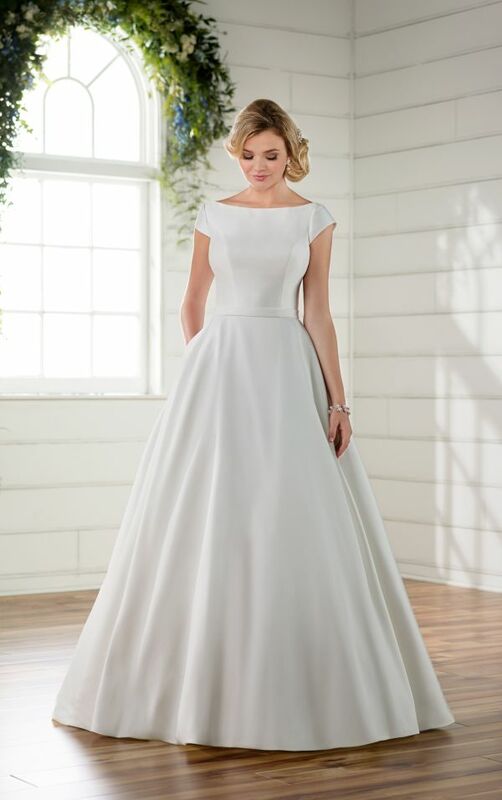 This vintage fit and flare wedding dress from Essense of Australia features a touch of glam that sets it apart from the rest. 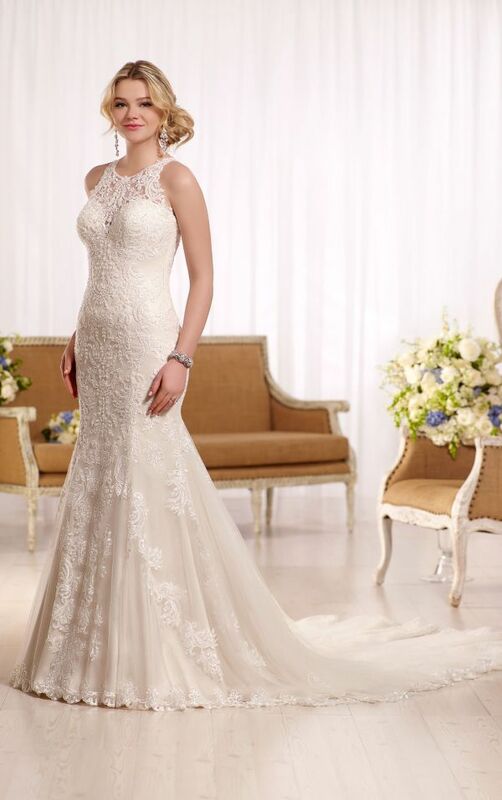 It's sweetheart, V-neckline is accented by sweet lace straps that extend beautifully into a high back. With its Lace and Tulle over Imperial Crepe bodice and skirt, this gown is as moveable and comfortable as it is gorgeous. Lace side cut outs and a lace cameo back add unexpected elements of glamour, while the wide flare train is utterly romantic with its double-scallop lace hem. The back of this gown zips up beneath fabric buttons. This structured wedding dress from Essense of Australia was made for the bride in search of a classic, timeless style with a touch of glamour. The high neckline of this gown is accented beautifully with Diamante - beaded cap sleeves that coordinate with its detachable Diamante - beaded belt. Visible seaming helps shape this Pearl Mikado gown to the body, helping to show off your curves. The back of this gown features a deep V back, and zips up beneath fabric and Diamante buttons. For the timeless, modest bride in search of a timeless, modest wedding dress, this is the one! This Pearl Mikado gown from Essense of Australia features elegant cap sleeves and a boat neckline. The waist is accented beautifully by an attached belt before the gown flows into a full, A-line skirt - complete with pockets! The back of the gown features a sweet low back and zips up beneath fabric buttons.